SORROWS KICK-OFF WEST COAST TOUR SEP. 2ND IN SAN FRAN! SORROWS' TOUR KICKS-OFF SEPTEMBER 2ND IN SAN FRANCISCO! The legendary post-punk power pop band SORROWS will be heading out on the road in September for a string of West Coast dates in support of their recent full-length album Bad Times Good Times, with additional East Coast dates to follow later that month. 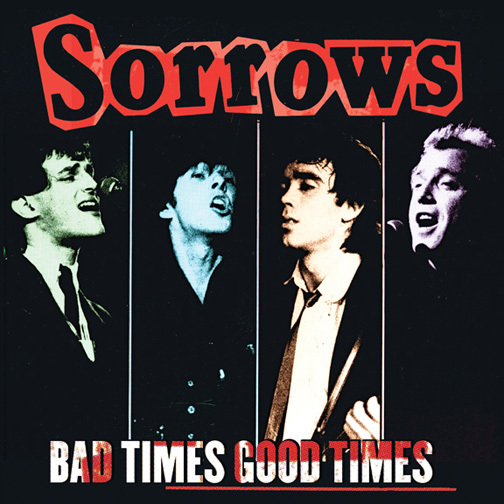 The recent release last winter of SORROWS' Bad Times Good Times (Bomp! Records) marked the first time ever that this music has appeared on CD as well as LIMITED EDITION VINYL. Filled with previously unreleased recordings of their power pop gems, demos and live performances, the album is a feast for post-punk new wave fans and collectors who have been asking for years to be able to get their hands on SORROWS' music. Formed in 1977 in NYC by Arthur Alexander (ex-Poppees), Joey Cola, Ricky Street and Jett Harris (ex-Poppees), SORROWS were all about the songs. Their tunes are filled with strong melodies, irresistible hooks and creative harmonies supported by their powerful backbeat and hard-driving guitars. SORROWS two critically acclaimed albums and several singles on CBS Pavillion have become highly praised and are sought after collector items.